Star of Indiana alum Lesa Nelson submitted this photo and caption. I took this photo while I was in Indianapolis on April 11 attending the Fire Department Instructors Conference exhibits. 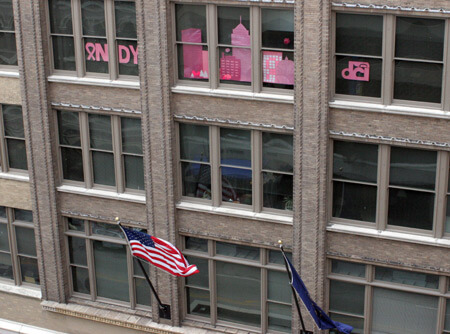 I parked on the roof level of the garage across the street, glanced over and saw the DCI logo (in pink as part of Susan G. Komen for the Cure's "Paint the Town Pink" contest). Welcome to Indianapolis!